Leucinodes orbonalis (Gueneé) (Lepidoptera: Crambidae) is frequently intercepted by the Plant Health Service in England and Wales on imports of aubergine from Asia and Africa. Between 1999 and 2008 it was intercepted on 104 occasions, 60 of these on Solanaceae from Asia. The caterpillar feeds inside the fruit, and so may not be detected until the damage is severe and secondary damage, such as rot, has taken effect. This damage can cause yield losses of more than 65% on aubergine in Asia. Whilst it is predominantly a tropical species, there is increasing concern that it could become established in the European Union, either in the Mediterranean member states, or in protected areas of cultivation in northern areas. One adult moth was caught in the UK at a light trap in Suffolk in 2006, but the origins of the specimen are unknown. Leucinodes orbonaliswas added to the European and Mediterranean Plant Protection Organisation (EPPO) alert list in January 2008. Leucinodes orbonalisis is found south of the Sahara in Africa. It has been recorded from Burundi, Cameroon, Congo, Ethiopia, Ghana, Kenya, Lesotho, Malawi, Mozambique, Nigeria, Rwanda, Sao Tome and Principe, Sierra Leone, Somalia, South Africa, Tanzania, Uganda, Zaire, Zambia and Zimbabwe. In Asia it is widespread, recorded from Bangladesh, Brunei Darussalam, Cambodia, China, India, Indonesia, Japan, Laos, Malaysia, Myanmar, Nepal, Pakistan, Philippines, Singapore, Sri Lanka, Taiwan, Thailand and Vietnam. There are also records from Saudi Arabia in the Middle East. Leucinodes orbonalisis is currently absent from Europe, Oceania and North and South America. However, L. orbonalisis is one of a number of closely related species and the almost identical Neoleucinodes elegantisis is a pest of aubergines in North and South America. Most plant health quarantine interceptions of L. orbonalis within the European Union have been on Solanum melongela (aubergine). Other members of the Solanaceae that have been recorded as hosts are S. tuberosum (potato), S. torvum (turkey berry), S. aethiopicum (African eggplant), and S. nigrum (black nightshade). More occasional hosts include S. gilo (scarlet eggplant), S. aculeatissimum(love apple) and Lycopersicon esculentum(tomato). Other recorded hosts, which may not be natural food plants, include Capsicum annuum (sweet pepper), Punica granatum (pomegranate) and Cucurbita species (gourds). The eggs are white or cream coloured and are laid singly or in groups on the underside of leaves. They are less than 1mm long, and usually oval in shape. When newly hatched, L. orbonalis caterpillars are c. 1 mm long and have a dark brown or black head with a body colour of pale pink to off-white. As the caterpillars grow, the head becomes paler brown and the pink colour on the body deeper. The final instar caterpillars have a definite pink body colour, with a pale brown to yellow head and pale brown spots on the body, and are about 18 mm long. There are no other distinctive markings. The newly hatched caterpillars will sometimes bore into shoots, causing wilting and dieback, before moving into the fruit as they grow larger; or they may tunnel straight into the fruits. The later instars all bore into the fruit of the host plant, feeding from the inside, so that they are only visible if the fruit is cut open. A single aubergine can be infested by between 1 and 20 caterpillars. Feeding damage to the fruit is often not immediately visible as the entry hole is usually small, near the calyx of the fruit, and the caterpillars block the entrance hole with excrement. The plant sometimes will regenerate tissue over the entry hole, making detection almost impossible. The entrance wound allows secondary damage to occur to the fruit, such as fungal attack or rotting, and this more noticeable sign will give an indication of possible L. orbonalis infestation. The caterpillar only emerges from inside the fruit when it is ready to pupate in the soil, leaving a much larger and obvious exit hole at this stage. The caterpillar pupates outside the fruit, spinning a thick, fibrous, dark brown coloured cocoon that is firmly attached to surrounding materials. The pupa cannot be seen through the cocoon. The adult moths are comparatively small, with a wingspan of around 20 mm. The base colour of the wings is semi-transparent white, with pale brown and darker brown patterns, and males and females are identically patterned. The moths only fly for short distances, in darkness, and typically rest on the underside of foliage with their abdomens curled upwards. The preferred host (aubergine) is the main crop that could be put at risk. 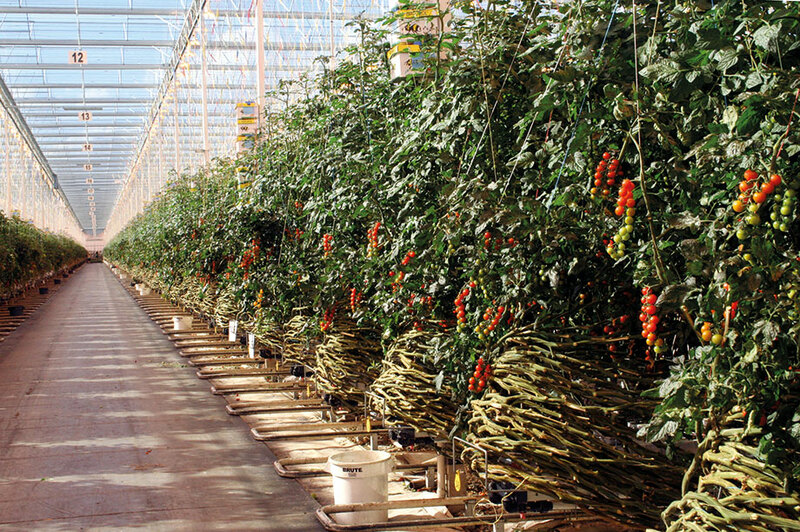 Economic damage occurs on this crop in Asia, but in England and Wales it is not a widely planted crop for commercial purposes, due to the high costs involved in heating glasshouses. 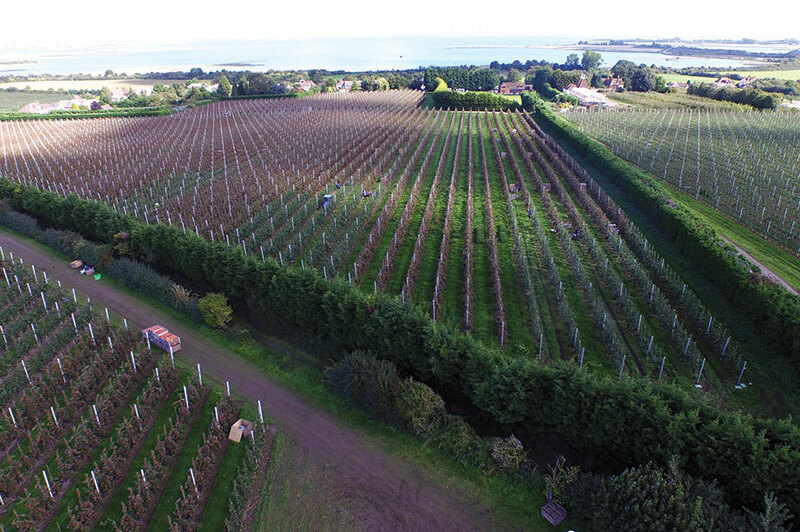 Historically, there have been crops of up to 2 hectares grown, with a UK total of 11 ha in 2004. Aubergine is also becoming an increasingly popular crop among amateur gardeners in the south of England, where it grows moderately well under cover. Potatoes and tomatoes, while being suitable hosts, are only attacked when there is no other food available, and there are no records of economic damage from L. orbonalis on these plant species. In the rest of Europe, approximately 89 ha of aubergine is grown under glass in the Netherlands, and in Mediterranean regions it is grown outdoors as a commercial crop. Leucinodes orbonalis caterpillars contaminate the fruit of the host plant with their tunnels and frass, as well as allowing secondary damage, e.g., fungal attack. This damage means that the fruit becomes inedible and is destroyed. As L. orbonalis caterpillars are difficult to detect, a substantial portion of the crop may be infested before damage is noticed and hence the economic loss can be significant. If the caterpillars bore into shoots and stems, or there is a heavy infestation, this will weaken the host plant and cause yield loss in unaffected fruits. Contact insecticides are not effective in controlling the caterpillars of L. orbonalis when they feed inside the fruit or stems. Effective control requires treatment at very frequent intervals, or carefully timed, to target the caterpillars between hatching and tunnelling inside the plant. Insecticides containing the active ingredients indoxacarb, teflubenzuron, deltamethrin or nicotine, or the biopesticide Dipel DF (Bt), are all effective insecticides for the control of caterpillars. Destruction of infested crops is effective in eradicating the pest if there are no alternative hosts, such as Solanumweed species, left for a population to re-establish from pupae in the soil. All parts of the affected plants should be destroyed, as caterpillars can be present throughout the host plant. Destruction of infested crops and any reservoir weed hosts is the most effective method of ensuring eradication of this pest. Suspected findings of L. orbonalis or any other non-native plant pest should be reported to the local Fera Plant Health and Seeds Inspector or to PHSI Headquarters, Sand Hutton, York.